Designed to unleash the bombshell in you, the Blowout Babe Thermal Brush creates that “just blown-out” look without the use of a blow dryer or hot air. Featuring a thermal ceramic barrel, ionic generator and a nine-foot 360° swivel cord, the blowout brush ensures easy styling with sleek, bombshell results. On dry hair, simply use the Bombshell Blowout Thermal Brush as you would a round brush and blow dryer to achieve a smooth, voluminous blowout in half the time. For added shine - activate the negative ion generator! Simply slide the on/off button all the way up until it glows red, then green. -1.5” Ceramic Barrel - emit far-infrared heat that instantly penetrates the cortex of the hair cuticle, heating from the inside out. The hair is heated evenly and in half the time of conventional heat, reducing the risk of damage. -0.5” Nylon Bristles - to gently grip, smooth and style all hair types and lengths. -Ionic generator - to increase negative ion output resulting in shiny, smooth, frizz-free results with zero static. -356°F / 180°C temperature - to smooth all hair types and textures. 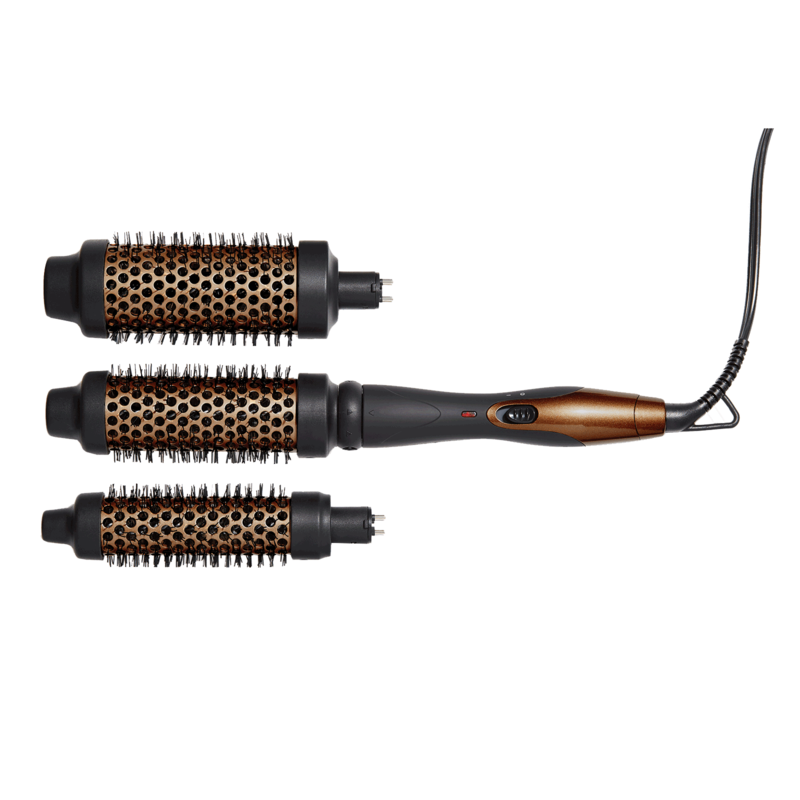 Heat resistant handle, cool tip design and lightweight body - to guarantee easy, comfortable and safe styling. -Ready And Able - an easy grip, 9 foot 360° swivel cord made of heat-proof, up to 450ºF (232ºC), fabric and a professional hook makes use and storage simple. -Dual Voltage 110–240 V for international adventures. "I love the versatility that this blowout brush offers. Call it a great buy."